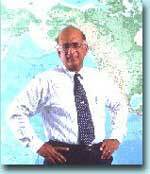 Since its inception in 1972, Jim Pinto was President and CEO of Action Instruments based in San Diego, CA. USA. After he retired from Action Instruments, he has been an angel investor, speaker, writer, technology futurist, author (two popular automation books, published in 2003 and 2005) industry commentator and M&A consultant. His popular JimPinto.com blogs and eNews are widely read. Jim Pinto was named California Small Business Person of the Year for the State of California in 1980. Jim has been featured in many books and national journals : INC - A Call to Action - November '83; INDUSTRY WEEK - A Manager for All Seasons - June '92; ESQUIRE - Re-defining the Role of the Employee - May '83. He is featured prominently in Joel Kotkin's book California Inc. and is mentioned in Naisbitt's Re-inventing the Corporation as a pioneer in participative management. In July '93, Action Instruments was named by INC magazine as one of the Employers of the Year - Workplaces Employees Love!. Jim has travelled widely throughout the world, and has significant experience in the comparative study of American, European and Japanese Business cultures. He serves as an international consultant in strategic business planning, marketing, sales channel development, technology planning and acquisition strategy. He is a Member of the Association of Professional Futurists and the World Future Society. He is active in Rotary of Carlsbad. Jim currently resides in Carlsbad, California. His interests include technology futures (he is a popular speaker on the subject); technology investments; writing (he writes for several webzines and journals and magazines) and blogs; poetry (he has been called : "The poet laureate of the Instrumentation Industry" and his poetry has been published internationally); Music (piano, MIDI); Chess (not a master, but he likes it); the Internet (an avid web-surfer, and he built and evolves his own web-site).